A special treat for the Fourth of July….Gluten/Dairy free raspberry layer cake! It’s actually really easy to make, since I used a mix for the cake itself. I used a cake mix from 123 Gluten Free, which I loved! You add your own sugar, so you have control over how much and what type of sweetener you add. It made two nice-sized layers of cake! Follow the directions on the cake mix, and let the cakes cool. I put them in the freezer to speed the process along! When cakes are cool, carefully cut each layer into two layers horizontally. You can use a long, sharp knife or a piece of thread to do this! The frosting is a wonderful, light, almost marshmallow-cream texture. You can use it as a substitute for whipped cream! It is very, very simple and it does not contain dairy or soy. You just need 2 egg whites, a cup of sugar, a cup of water, vanilla, and a half-teaspoon of cream of tarter. Combine the water, and sugar in a sauce pan. Bring the solution to a boil, and boil until it begins to make a syrup. In a mixing bowl, beat egg whites, vanilla, and cream of tarter until they start to froth. Slowly add the sugar syrup to the eggs, beat until stiff peaks form. Spread raspberry jam on the cut side of one cut cake layer. Add a thin layer of frosting on top of the jam. Place a second cake layer, cut side down, over the first. 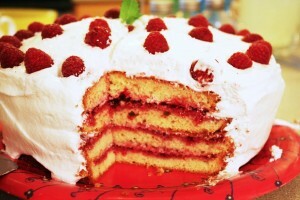 Repeat the process with the layers of jam and frosting, topping cake with the un-cut side of the cake up. Frost the top and sides of cake with the frosting. 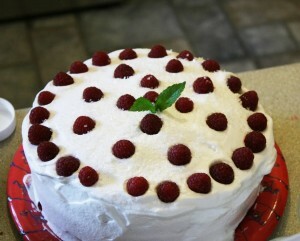 Decorate with fresh raspberries, a sprig of mint, and a sprinkle of decorating sugar. For the Fourth of July, you could serve a rectangular slice of this cake with a dollop of frosting in the upper left side of each slice, and a few fresh blue berries on the frosting….little American Flags!